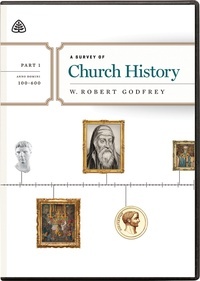 Many committed, knowledgeable believers still know little about the history of the church. As a result, they’re missing a testament to God’s steadfastness over the centuries. Now, a monumental new teaching series sheds crucial light on church history, demonstrating Jesus’ promise to build and preserve his church so that “the gates of hell shall not prevail against it” (Matt. 16:18). Join Dr. W. Robert Godfrey as he takes believers through the first twelve lectures of what will be a seventy-three-lecture series covering theology, apologetics, notable church fathers, and much more. Part 2 A.D. 500-1500, Part 3 A.D. 1500-1600, Part 4 A.D. 1600-1800, Part 5 A.D. 1800-1900, Part 6 A.D. 1900-2000, or the complete set, are also available.